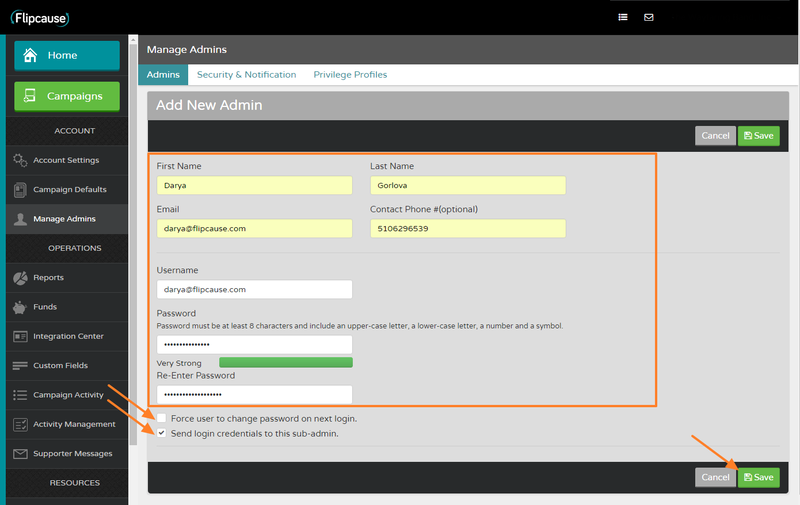 To add a new admin account, go to Manage Admins in the main menu and click on Add New Admin. Enter the new user's information. You can auto send the new user their login information, as well as force them to change the password when they next log in. Once everything is correct, click Save. By default, new administrators have no privileges. Someone with no privileges will not be able to access any area of Flipcause except the welcome message (should you choose to add it) and the area to change their login, username, and password. To give new admins access to areas of Flipcause, be sure to click on Edit Privileges.